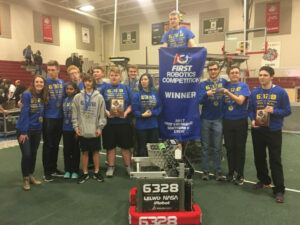 Littleton’s FIRST Robotics Team Mechanical Advantage 6328 recently won two awards at the Granite State District Competition. 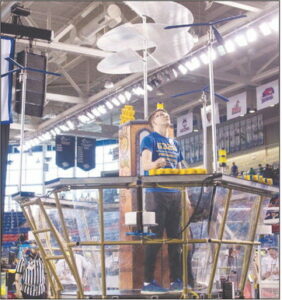 Littleton didn’t have a robotics team eight months ago. Now, the town has a team of award-winners. Members of Littleton’s FIRST Robotics Team, named Mechanical Advantage 6328, recently competed in the Granite State District Competition in New Hampshire, finishing fifth of 39 teams and bringing home two awards – Highest Rookie Seed and Rookie All Star. Mechanical Advantage 6328, Littleton’s rookie FIRST Robotics Competition team, opened the 2017 competition season by attending the kickoff event on Jan. 7 at Southern New Hampshire University. 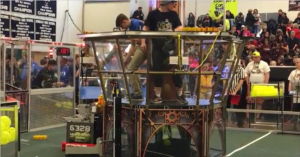 The event included the release of the animation describing this year’s game STEAMWORKS (available for viewing at littletonrobotics.org), and allowed the team to walk around a demonstration playing field to investigate what they’ll be using in competitions. 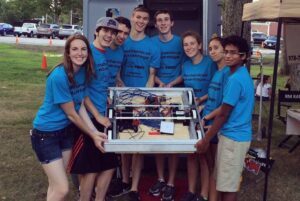 “Physics says this isn’t going to happen.” The group of students huddled around a test robot they built during the summer, a square measuring roughly three feet by three feet with rows of wheels on two of the sides. They looked in at the complex network of wires and circuitry and then up at Zac Temple, 21, one of their mentors. Their attempt to use the test robot’s wheels to launch a ball had not gone quite as planned. “Well, we failed,” Temple said. “Let’s eat!” the group’s other mentor, 21-year-old Deanna Clark, chimed in almost immediately. 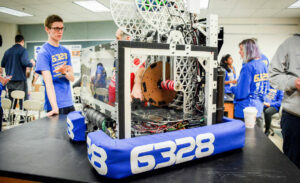 Mechanical Advantage, a new FIRST Robotics Competition team, formed at Littleton High School. The goal of the student-led group is to build a FIRST approved robot that will compete in the 2017 FIRST competition. This is a coed team for students in grades 9-12 interested in science, technology, engineering and mathematics fields such as engineering, robotics and coding, as well as students interested in photography, graphic design, video production, writing blogs and articles, social media promotion and finances.